A sparkling night of entertainment has raised more than £85,000 for Martin House Hospice Care for Children and Young People as it hosted its annual Glitter Ball on Friday, May 5. Rudding Park, Harrogate was the setting for the ball, which saw celebrities including Emmerdale stars, led by Martin House ambassadors Jeff Hordley and Zoe Henry, among the 530 guests. Former England and Leeds United footballer, and Celebrity Masterchef runner-up, Danny Mills was also at the ball, auctioning himself off to cook a meal in the home of the successful bidder for up to ten people – which scooped £4,000 alone. A diamond necklace donated by Berry’s Jewellers was also auctioned off for £5,600, helping to make the evening the most successful Glitter Ball Martin House has held. Guests also enjoyed a champagne reception, dinner and entertainment from Harrogate band Nightjars during the evening. Brenda Peel, Martin House corporate fundraiser, said: “This was our biggest and best Glitter Ball yet. 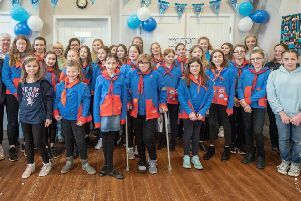 “Everyone had a fabulous time and we are thrilled to have raised such a huge amount, particularly in our 30th anniversary year. Martin House provides care and support to children with life-limiting illnesses and their families at its Boston Spa-based hospice and in the community. To find out more about its work and how to support the hospice, visit www.martinhouse.org.uk.